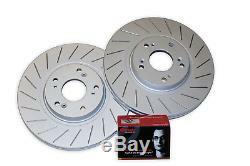 Civic Type R Front Coated Brake Discs and Brembo Pads EP3 FN2. 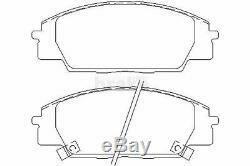 A front set of Evora performance grooved brake discs supplied with a set of brembo brake pads to fit the Honda Civic 2.0 Type R.
Below are the product item particulars, please check that the information below meets your requirements. Placement on Vehicle Front, Left and Right. Brake Disc Diameter (mm) 300. 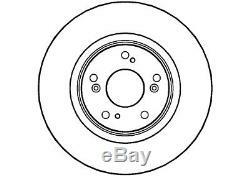 Brake Disc Type Internally Vented. Disc Thickness New (mm) 25. Disc Thickness Minimum (mm) 23. Stud Hole PCD (mm) 114.3. Height of Brake Disc (mm) 48. Brake System Criteria EP3 and FN2 Chassis. Information Compatible with FN2 and EP3 models. Credit or Debit Cards exc. As brake discs are manufactured from cast iron they will naturally oxidize (rust) when exposed to moisture, this process will happen with days and is perfectly normal although this doesn't look pretty the function of the discs will not be affected. Some of our brake discs however are now being supplied with a protective coating, this may be in the form of a Geomet coating or special paint, this process is happening based on stock rotation from our suppliers. Please provide your vehicle registration number when ordering so we are able to verify you have ordered the correct part for your vehicle, we may also contact you for additional information when your registration number provided size options or variations. Failure to provide your registration number or reply to our messages will delay your order. The item "Civic Type R Front Coated Brake Discs and Brembo Pads EP3 FN2" is in sale since Wednesday, July 13, 2016. This item is in the category "Vehicle Parts & Accessories\Car Parts\Brakes & Brake Parts\Brake Component Packages". The seller is "brake-depot" and is located in S43 3PT Derbyshire United Kingdom. This item can be shipped worldwide.